Browse to https://magpie.education/accounts/password/reset/ in order to reset your password. Alternatively click the "Login" link from the toolbar on any page and then click on "forgot?" What if I use Facebook, Twitter or Google to sign in? 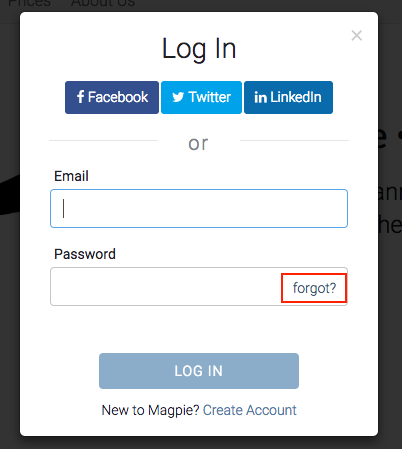 If you've created your Magpie Education using social login from Facebook, Twitter or LinkedIn, then we don't have any password stored on our servers. I can't remember which email or social login I used? Drop us an email to info@magpie.education with your name and which email address you think you may have used.